You Are Here: Home » Featured » Quinn Cody is headed for Dakar! Quinn Cody is headed for Dakar! 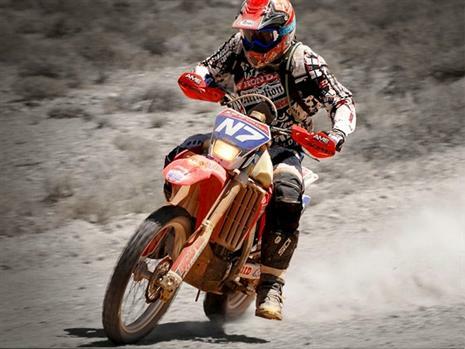 In a partnership between JCR/Honda, American Honda, Honda Europe and HT Rally Raid among many others, Quinn Cody is poised to take his speed, endurance and championship riding to the World Rally stage at the 2011 Dakar. Anticipation and expectations are high as Quinn is in a position to take the Dakar by storm. Make no mistake however, the Dakar is no easy task and the American champion will have to be on his game. Lucky for America, Quinn Cody is just the guy to do it.His recent exploits include winning the 2010 Baja 500 and the remarkable, solo winning of the 2010 Vegas 2 Reno overall. Be prepared to follow along as Quinn Cody takes on the world in the 2011 Dakar. He will be racing on a JCR/Honda, HT Rally Raid modified Honda CRF450X, appropriately named the DakarX. The 2011 Dakar is a 15 day, nearly 6000 mile event, aired in 190 countries every day for several weeks so the global exposure from this race is off the charts. The Race begins and ends in Buenos Aires, Argentina with scrutineering on December 30th & 31st 2010. Opening ceremonies begin January 1st 2011 and the finishing ceremonies are taking place back in Buenos Aires on January 16th 2011. Watch this video and read more about the Dakar here.